I was sent a bottle of Soft Scrub Mold & Mildew to sample and review. 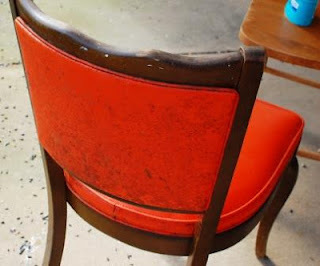 All opinions and nasty retro chairs are my own. We are having a cocktail party in our backyard a couple of weeks from now so I have been gathering up chairs and various bits and bobs to create "zones" all over the yard. It just so happened that my Momma was cleaning out her storage shed this past week. I was accumulating and she was throwing out - a perfect combination. 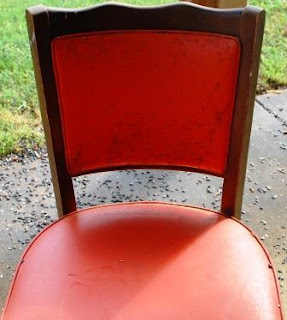 I called to ask her if she had any surplus chairs in her discard pile and she said she had two. 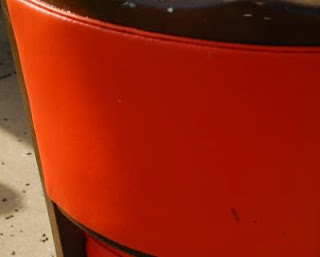 The one pictured above which was a plain ol' nothing special run-of-the-mill breakfast table chair and this retro orange vinyl number that she didn't even know she had. She did mention that it needed a good cleaning. Ummm....yep. It did. Please excuse the speckles of spent sunflower seeds all over the patio. The birds have no manners. There was mold all over the vinyl and although it was pretty gross, I had just the stuff to tackle the job - New Soft Scrub Mold & Mildew. After the mold and mildew cleaner (and a teeny amount of elbow grease) was applied, the chair looked like this. I can do nothing about the hideous color of the chair but at least I got rid of the mildew. I was pretty impressed by the product since it took very little effort on my part to get off the grime. It's a gel instead of a spray which makes it easier to stick to the mildewy parts instead of running down the sides and dripping off onto the floor. 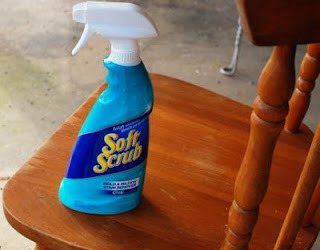 You may have a moldy shower or some mildewy chairs lurking in your shed that might need a Soft Scrub make-over and I would love to give you the opportunity to try it out. Enter the rafflecopter below for a chance at one of three coupons for a FREE bottle of Soft Scrub. The names will be drawn Saturday, May 11th, 2013 and the winners will have three days to respond before another name is drawn. Good luck! The winners have now been contacted. Just lot of storage bins and crud. 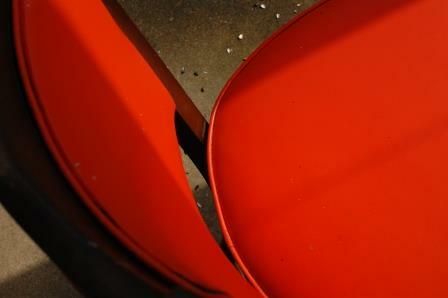 There is a stack of white plastic chairs that we take out just for barbecues that need a really good cleaning! I don't have a shed yet...we're renters! I don't have a shed, but my shower could use a good cleaning with this. I keep my folding table and chairs in the shed, and they always get grimy over the winter! My grandson's outdoor toys could use a good scrubbing! I don't have a shed, but my garage is starting to get piled up with my projects I have been accumulating while in grad school. We rent, so we only have a mini-shed. We have baby clothes in there and lots of spiders! I don't have a shed but I have a lot of things that need cleaning! Lawn mower, snow blower, bikes, toys, chairs..
We have toads under and somewhere in the shed...enough said! My shed is actually very organized! i don't have a shed. but i keep my gardening "stuff" in a big old dog house. We found an old dutch oven which was in great shape, we just seasoned it and it is ready for use. A couple of lawn chairs that could use a good cleaning. I don't have a shed, but my screened back porch has spiders. I have a stack of lawn chairs that could really use a good scrubbing! I would have to say spiders bugs pool stuff backyard chairs lawn equipment! oh god the list is long. We don't have a shed, but our golf cart could use shining up a bit! Mostly garage sale stuff. Like a dolls head knitted into a dream weaver that I bought at the local senior center. I don't have the heart to throw it out because it was hand made and I hate to take stuff to the donation center because after standing in line they tell you that they are not taking clothing today or whatever. Today they gave me books back and told me that they are not taking books. I have a family of bunnies living UNDER my shed, but I couldn't tell you what is inside of it!